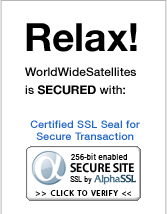 Safe and Secure Certified SSL. Free Fast Shipping for Order Over $99. We Sell Only Original Authentic Products. Lowest Pricing. Price Match Guarantee. Providing Satellite Products for Over 10 Years. Discontinued Free to Air Receiver Brands. Some of these brands may still be available in our Clearance Section. We also have used receivers available, if you have interested in particular discontinued models please contact us by Live Chat, Email (customer service page) or Call us. Choose a brand or product below. WorldWideSatellites.com is your number #1 satellite superstore for all your Free to Air satellite, Over the Air Antenna and IPTV Internet TV needs. WorldWideSatellites carries almost everything you need for free to air such as high definition FTA receiver, standard definition FTA receiver, satellite fta dishes and Other Satellite Related products/accessories. We strive to achieve the best customer service, Best Pricing in Canada/USA and provide the latest free to air satellite receiver brands like Conaxsat, i-Link, Dreambox, Kbox,Viewsat, Sonicview, Limesat,Nanosat,Openbox,nFusion and many more receiver brands. WorldWideSatellites are product dealers of Channel Master, Winegard and Antennas Direct which produce the best quality OTA Over the Air Antennas and accessories. Looking for Greek,Turkish,East African and Arabic Channels? WorldWideSatellites are Authorized Resellers for Zaaptv IPTV internet TV. We also carry Jadoo TV IPTV for Indian channels via internet. WorldWideSatellites ships to around the world and fast free shipping to Canada and USA. WorldWideSatellites has two resellers, Ontario California and Mississauga Canada (Near Toronto,Ontario). WorldWideSatellites also carries other electronics such as MagicJack voip (+ Magic Jack Plus),Bluetooth wireless earpieces and Security Cameras.